Flying home to Canada from Madrid via Air France I had a stop over at Charles de Gaulle. Upon checking in at Adolfo Suaréz Madrid-Barajas I was informed that my flight was delayed. It ended up being an extra hour before I boarded. Given that my connection was only an hour and forty minutes to begin with, I ended up mising my second flight. I was directed to multiple different kiosks around CDG before finally consulting with an Air France representative. I was given two options: take a later flight, be redirected through New York, or Washington, D.C. and have to pay a fee (something to do with landing in America), or have a complementary one night stay in Paris, including three meals and board the same flight I would have had the next day. Afterall, a wise woman once said: Paris is always a good idea. Even though my luggage was to stay the night in Paris with me, I wasn’t allowed to collect it. So I was given what resembled a large pencil case, containing: an oversized white t-shirt, a disposable razor, roll on deoderant, tooth brush, toothpaste and L’Occitane moisturizer (that I kept) and was sent on my way. I recieved a shuttle service to my hotel, where I showered and changed (luckily I always bring a change of clothes for stop-overs). I got straight to heading into Paris, which is about a one-hour train ride from the airport. On that note, Toronto: please, please expand the TTC to reach the airport, how is this not the obvious best choice. For those of you who’ve never been ,you actually have to take a completely different transit system to get out to the airport, via BUS! Having been to Paris before I wasn’t overly concerned with sight seeing and actually ended up enjoying myself much more this time, as I could just meander about and enjoy the beautiful city. I was much younger the last time I had visited and hadn’t appreciated how lovely it is. I’ve always thought Paris is overrated, but I get it now. I also have to say that the Parisians seem friendlier now… is this accurate? I had a very nice gentlemen explain the transit system to me at the train station. I love the Paris train stations, I very much missed the bells they use to indicate departures! I figured a good a place to start as any in Paris is the Eiffel tower. Upon exiting the subway I couldn’t see the tower, and decided to cross the street and walk in an arbitrary direction. Though, as I crossed the road, the tower slowly began to appear from the tops of trees as a behemoth. I was a bit taken aback by my own reaction to the structure. As I have mentioned, I’ve previously been to Paris and seen all the usual sights and didn’t think I would be in such awe of it’s beauty and sheer presence as I was. I purchased a pistachio ice cream cone frome a street vendor and took a stroll around the Eiffel Tower and park, as well as the Seine. Paris is a truly beautiful city, with a little sprinkle of magic on top. 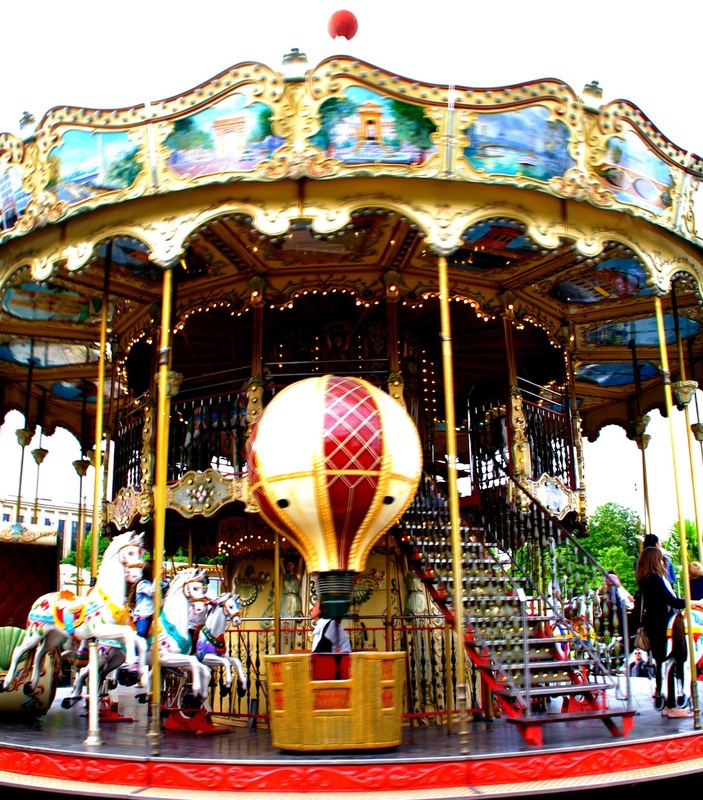 All of the trees are neatly manicured, gilded gates line the streets and of course the antique carousels make Paris a perfectly charming city. I think the chicness of Paris for me was also intensified by the contrast of my having just been to the bohemian city of Porto. Being a lover of macarons, especially those of Ladurée, it was on my list while connecting at CDG. However, since I now had the opportunity to see Paris, I figured I must go to the Ladurée flagship on Champs-Élysées. I was having a difficult time navigating the Paris metro, which to a Torontonian is massively overwhelming, it can take several minutes just to locate your stop on the map, followed by working out the logistics of connections. I noticed there were some metro workers aiding travellers with navigation. Being Canadian, I studied French in school for eleven years, eight of those being spent in French immersion. 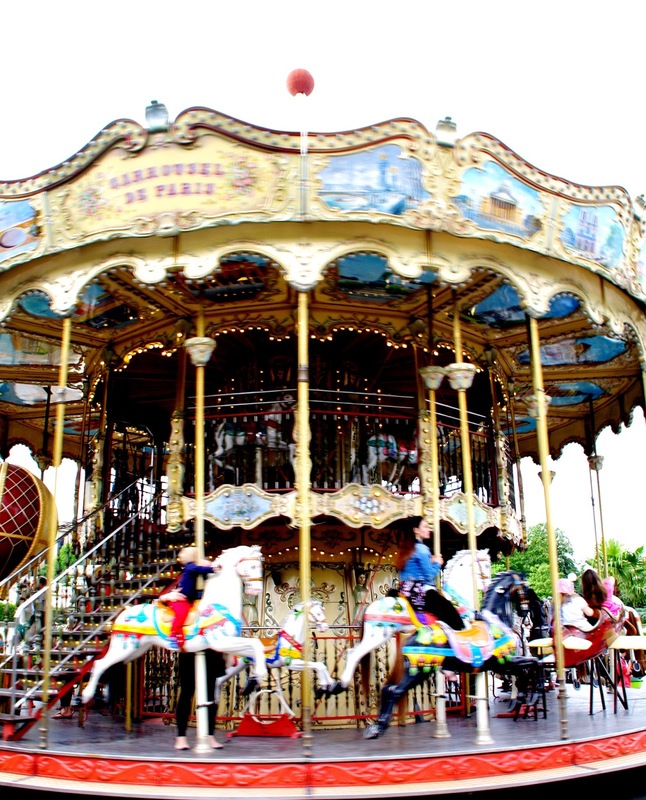 Yet, the last time I visited France I was not at all confident about my skills and rarely used it. However, perhaps due to spending a week with non-native English speakers I decided to put my knowledge to work and consulted the metro staff in French, which went over fairly well. I’ve now resolved to take French calsses, in hopes to live in France one day and be able to communicate with ease. 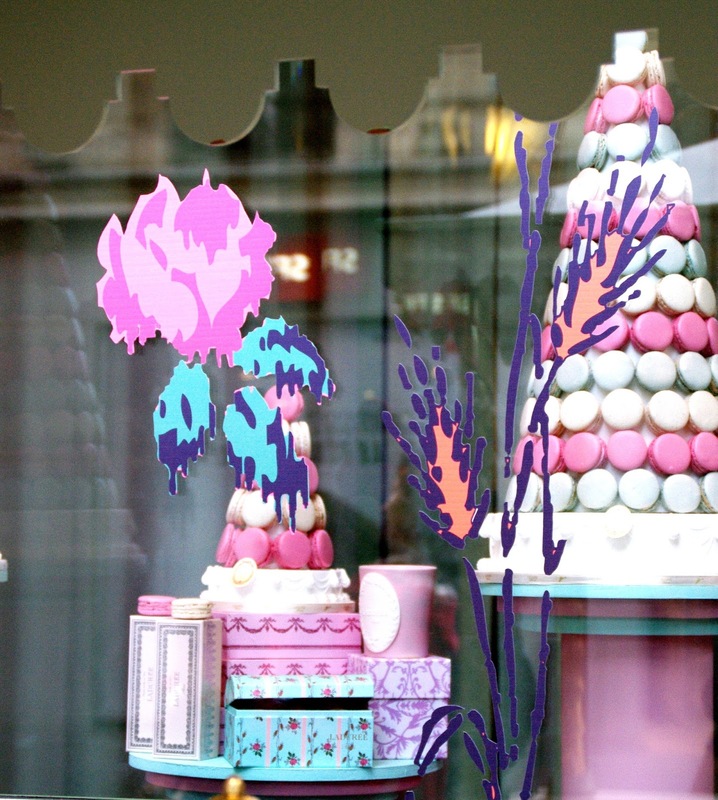 The Ladurée at Champs-Élysées is goregous! I want my apartment decorated just like this little pâtisserie. There was actually a short wait outside the shop, followed by a lenghty wait inside…entirely worth it though and there is no shortage of things to look at while you await your turn. I ordered a small box of six cookies, one of which was named for Marie Antoinette (my dinner guest alive, or dead). After asking to use to use the lavatory I decided, “I’m in Paris, I need to eat, and you only live once!” So I got a table, complete with a white table cloth and settled in for a lovely meal. It was slightly unnerving to be sat at such a nice restaurant in my Lululemon pants and TNA hoodie, but I tried not to be vain and just enjoyed the night for what it was. My meal began with a bread basket, which I tried not to over-indulge in, as well as a bottle of Evian. I ordered a celebratory glass of rosé Champagne (Pop! Fizz! Clink! ), oviously celebrating a free (I use that term loosely) night in Paris (I think I spent more money one night in Paris than three days in Porto- being chic doesn’t come cheap!). For my entrée (which I’ve learned is only what North American’s refer to as their main meal- makes sense as it is acutally the french verb “to enter”, and makes much more sense as the word for appetizers…I digress) I had a chicken sandwhich with fries. The sandwhich was actually kind of a cross between chicken salad and egg salad- quite good, I may have to start making these at home! A was alotted four fries, stacked on top of each other, like a jenga tower! I couldn’t finish my meal and couldn’t take it home, as this custom is not followed in Europe, though my lovely server commented that they should adopt it (possibly just to please her very North American guest)! I was certainly reminded of the difference in service between North America and Europe, which although I’m tolerant of now, I may never get used to… ordering my meal and never seeing my server again! 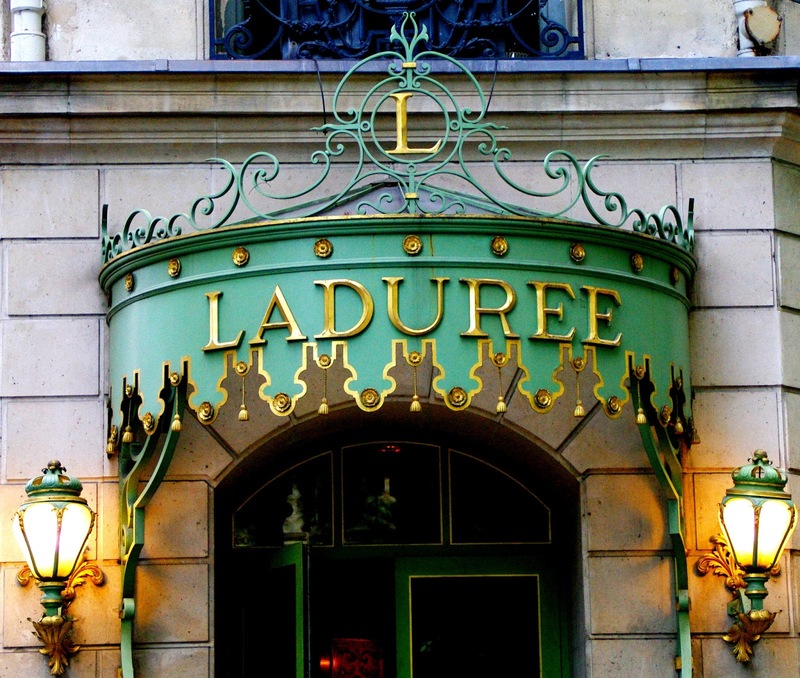 I was actually sat next to a couple from South Carolina, with sickly sweet southern accents, who chatted with me a bit about dining alone (I get the feeling Ladurée is frequented primarily by tourists and not much of a regular spot for your average Parisian). Following my meal I took a stroll down Champs-Élysées to see L’Arc de Triomphe, before retiring. I FINALLY learned how to navigate the Paris subway, realizing that you must consult the overhead screen to learn which train is in the station/arriving next and thus whether, or not it will stop at your stop. Which is convenient if you’re waiting, but my experience with the TTC is running downt the stairs to catch my train and never having to worry whether, or not it’s the right one, so long as I’m on the right track! I arrived back quite late to catch my shuttle bus to my hotel and after waiting some time, I asked one bus driver if he was going to my hotel. Though he didn’t, he was going very near by and told me to hop aboard. He actually ended up taking me right to my hotel…seriously WHEN did Parisians become so friendly!? I had a filling breakfast in the hotel the next morning, replete with all of the scrumptious french confections I could have desired and promptly headed off to the airport. This time I caught my flight, for the record, the two times I have flights out of CDG I’ve missed them…I don’t seem to have the best luck there. My flight was comfortable… Air France provided me with a Champagne apertif, to which the flight attendant inquired how old I was, “Darling, you flatter!”. I have to give props to Air France for the delivery on the in-flight safety videos, which I was so amused by I watched start to finish. If all airlines videos resembled a chicer version of Old Navy adds, complete with flight attendants dancing around in the latest red, white and blue fashions I would surely be interested in how to inflate my life preserver. After running out of in-flight entertainment (I swear!) I resorted to watching Fifty Shades of Grey, a movie I was positive I would never see. I’ve never read the books, but given their hype I knew what I was getting into. I won’t lie, there are less entertaining things to watch while stuck in an uncomfortable seat, ten miles high in the air. I did, however happen to look away from the screen at one point and become incredibly aware of other passengers, who may not have been so keen on the mature content…c’est la vie, oui? Though it’s rare that one is grateful when travel plans are interrupted, I couldn’t have been more pleased with an extra day on vacation, in Paris none the less! I had such a wonderful time and I’m very much looking forward to returning in the near future, I still have to see Versailles after all!